What is Spacehive? How does it work? Spacehive is a crowdfunding platform designed for projects that enhance our shared civic life, be that sprucing up a local park, holding a community event, or repurposing a disused building. We aim to revolutionise the way communities grow, making it easy for locals to choose the changes they feel their community needs, and back their idea up by collecting funds not only from neighbours but also from local business, councils, and grant bodies. Our verification system and grant app makes Spacehive projects appealing to big backers, so make sure to check for Funds you might be eligible for – we’ll match you up with them automatically, no laborious grant forms needed! You can use Spacehive either as a Project Creator, a local backer, a business backer, or as a grant body/council backer. It’s a fast and fun way to transform where you live: just find a project you love using our map tool or find a Movement in your area and pledge a contribution. Payments are only charged if projects hit their funding targets, so you only pay if the project goes ahead! We are an independent company based in London that launched in 2012. We love what we do and who we do it with. If you like what Spacehive is about say hello, check us out on Facebook or Twitter or check out our job listings! What are the fees? Is there a charge? Spacehive charges a 5% fee (+1% VAT) on funds raised if, and only if, you hit your target. The 5% fee pays for the development and maintenance of our technology platform, the process of verifying projects, and the support that we provide. This is 5% (+1% VAT) of your total project costs and is automatically added onto your campaign total. So if a project needs to raise £100, a £5 fee and £1 VAT will be automatically added, giving a total of £106. There are also transaction fees; PayPal at 3.4% + 20p per pledge and GoCardless at 0.5%. These are estimated at the beginning of your campaign and are automatically added onto your total project costs. Because these are estimations you might notice your campaign target fluctuating depending on the payment methods used by backers and the pledge sizes. Generally the transaction fees are overestimated so you’ll probably see your target decreasing, especially if you get a big pledge or if you mostly receive GoCardless pledges. Spacehive and transaction fees are shown in the Costs tab of project pages. How does the all-or-nothing crowdfunding model work? Spacehive operates an all–or–nothing model, which means that if you don’t hit your target, none of the pledges are collected. This can seem daunting at first however it has many benefits. It helps you raise more money than possible with a keep-it-all model due to the sense of urgency it creates. It’s less risk for everyone. If you need £5,000, it’s not much good having £1,000 and crowd of people expecting you to complete a £5,000 project. It’s easier to make backers part with their money. They will only be charged if you hit your target and deliver some community transformation. It works. 53% of Spacehive projects are successful, which is much higher than the crowdfunding industry standard. Once the initial funding target has been reached, projects can continue to raise additional funds to make the project even bigger and better in overfunding. If the project has overfunding enabled, details of how the extra funds will be spent are explained on the project page and backers can choose whether to keep pledging towards those cost items too. Find out more about overfunding here. If you’re an individual, community group, school, company, or council, you can create a project on Spacehive, as long as the project idea itself is eligible. You can check our eligibility criteria here. Is my project eligible for Spacehive? Spacehive is all about transforming spaces and places! Projects cannot be solely to fund courses, classes, or ongoing work. Projects cannot be solely for charitable fundraising. Projects must be in the U.K. Projects can be led by any type of organisation or individual. A project on Spacehive must clearly show how it could impact a public space for the benefit of the community. This can be something that directly improves an area, such as painting a street mural or repurposing a disused building, something that can lead onto neighbourhood improvement, such as a feasibility study or planning consultation, or something temporary that brings people together such as organising a festival or event. The project can be either permanent or temporary, and funding can be sought for both revenue and capital costs. Spacehive projects happen in shared spaces, which can be owned and managed either privately or publicly, but for the purpose of the project must be open and accessible to the community, and anyone else who wants to see it be used, or use it themselves. Still unsure if your idea is one for Spacehive? If you can answer yes to these questions then your idea is probably eligible for Spacehive. Does my idea transform a shared, or publicly accessible space in the UK, either temporarily or permanently? Am I crowdfunding for a project with a clear deliverable for my backers, as opposed to funding running costs of an organisation? Would my project help to enhance our shared lives and bring communities together? Upload the basic shell of your idea and send a link to info@spacehive.com- we’ll check it and offer advice on how best to proceed. Spacehive is open to anyone looking to create something amazing within their community but we do have a few guidelines all project makers must follow. Number 1. Everything on Spacehive must be a project. A project is something with a clear end, like building a playground, planting a tree, or putting on a festival. A project will eventually be completed, and something tangible will be produced as a result. Success. Number 2. Projects must be civic. Projects must have a civic value, meaning the benefit should be felt in the places we share, rather than our private homes and offices. Projects can be permanent (like a new playground) or temporary (like an event) and they can include revenue as well as capital costs. Number 3. It doesn’t matter who you are. 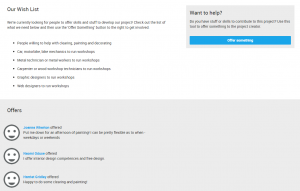 Creating projects is open to any organisation or person over the age of 18 and based in the UK. If you’re an organisation it doesn’t matter what your legal structure is – for example whether you’re a charity or a for-profit business. Everybody is welcome to get involved. Are those the only guidelines? Those are the main three, but below is a list of specific uses of Spacehive that are not allowed. Spacehive cannot be used to raise money for causes, whether it’s a charity run for Oxfam or a fundraiser for the work of a local conservation group. Other sites will be better suited to fundraising for these causes. Projects cannot offer equity or financial incentives (share of profits, ownership, the repayment of loans or cash-value equivalents). No offensive projects (e.g. murals with racist content) or projects that promote political or religious ideologies. And keep it clean folks. You know who you are. Projects cannot offer rewards that offer entry to raffles, lotteries, or participation in gambling. That includes Vegas style blackjack to the Village tombola. No projects outside the UK. Yet. You can change your name in your Settings > Your Account. If you’ve agreed to be the Project Delivery Manager of a project you won’t be able to edit your name. Please contact support@spacehive.com for help with this. You can change your email address in your Settings > Your Account. You can change your password in your Settings > Your Account. You can edit your biography by going to your Profile from the drop down menu in the top right of your screen. You can edit profile image by going to your Profile from the drop down menu in the top right of your screen, then clicking on the circle photo space. You can request for your account to be deleted in your account settings, by clicking Delete Account as in the screenshot below. 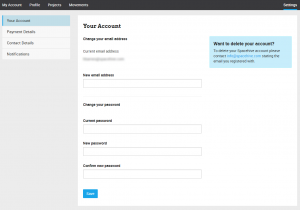 Spacehive will then check if your account for deletion, and if so remove all data immediately. Your account may not be able to be deleted automatically if you have a project that is either fundraising or successful, or you have backed a project that is currently fundraising. If your account falls in to one of these categories, please email info@spacehive.com with a request to delete your account. After checking your idea is eligible for Spacehive, create a project through our Create page, here. To find out what information you’ll need to enter and how to create a great looking project, check out our Ultimate Guide to Crowdfunding, here. You can save each step as you go and return to add more, or make edits, at any point up to submitting your idea for verification. What’s verification? What do I need to do before creating my project? All crowdfunding campaigns require planning before they begin. If you prepare well, you’ll boost your chances of having a successful and exciting campaign. How much money do you need? Are you raising the full budget or a portion of it? Do you have a suitable contingency? Avoid later headaches by doing your research, and be as transparent as you can. Supporters will appreciate it. The majority of our projects take place in shared spaces that require permission from the landowner, or even local authority. If this is relevant to your project, then consider who owns the land, and who will maintain it once delivered, to see if additional permissions will be required. Spacehive is not a magical source of money. Funding comes from a variety of sources — your friends and colleagues, your broader social or business networks, and, if your project does well, strangers from the broader Spacehive community and even broader world wide web. It’s up to you to build that momentum for your project – it won’t happen automatically. Once you’ve researched your budget and considered your reach, you’re ready to set your funding goal. Because funding is all-or-nothing, you’ll only collect what you raise if you hit your target – so make sure it feels realistic. Think about out how much money you need to complete your project as promised (while considering how much funding you think you can realistically generate), and select an amount close to that. Remember that you can add any additional items that would make your core project even bigger and better to either your Wish List, for in kind contributions, or as Overfunding targets, when more cash would help. What’s Overfunding? What’s a Wish List? Funding can last anywhere from one to 365 days, however a longer duration is not necessarily better. Short projects that prepare well for their campaign, and push hard during it, tend to do better because they create a sense of excitement and urgency. Longer projects tend to encourage procrastination and lose momentum. Can I run a crowdfunding campaign by myself? The majority of projects on Spacehive are created by organisations who have either formed to create a specific project, or an existing organisation that has recognised crowdfunding as a way to raise funds for a new project. Individuals run a lot of great projects too though, and a lot of our biggest and best campaigns have been organised and delivered by one person. Once the campaign’s off and running you’ll often find people want to add support with more than their money as well, and can help form a team around you. If you are planning a campaign as an individual, it’s a great exercise to map out where your current strengths in fundraising are, and where you could benefit from some added support. Have you got a good social media network and decent marketing ability for example, or could someone really add a lot to your campaign by supporting you with that? If you could use some extra help the first thing to do is to approach like minded people and friends and family, your core crowdfunding supporters, to see if they can lend a hand. And remember that Spacehive are always here to help as well, starting with our ultimate guide to crowdfunding all the way through to bespoke support helping you unlock cash from the business and funding community. Drop us a line at info@spacehive.com throughout your campaign if there’s anything we can help with. Should I create the project as an individual or organisation? If an organisation you’re a member of is running and will be delivering the project you’re creating, please make sure you register the account as an organisation when signing up. This is important as some Funds will only pledge to projects ran by organisations and some Funds will only pledge to projects ran by individuals. If you register the account as an individual when you’re acting on behalf of your organisation, you may be matched to funds that aren’t relevant, and vice versa. If you’re unclear about the type of account you should create, you can consider which bank account will be accepting pledges and paying to deliver the project. If it’s a personal bank account then you’re probably running the project as an individual, if it’s a company bank account you should probably register as an organisation. If you’re unsure about which account type to create, please get in touch at support@spacehive.com. Do I need a video? To get the project page and campaign up and running you just need an image for your project, not a video. A video can be added to your project at any point during the set up or running of your campaign. If you haven’t already got a video, you should think about creating one as a video is by far the best way to get a feel for the emotions, motivations, and character of a project. Crowdfunding projects that have videos are generally 20-30% more likely to succeed than those without. Some videos are professionally made, but most videos are just someone telling their story straight into the camera. You can spend days shooting and editing, or you can just knock it out with a couple friends on a Saturday. It doesn’t have to be perfect, it just has to be you. Tell us the story behind your project. Where’d you get the idea? What stage is it at? How are you feeling about it? Talk about the benefits your project will bring. Clearly and openly ask for people’s support, explaining what the funding is for. Explain that if you don’t reach your goal, you’ll get nothing, and everyone will be sad. Finally, make sure your video is 100MB or less, formatted in MP4. Top tip: If you’re shooting your video on your mobile phone, hold it horizontally so you get a nice wide shape instead of a tall skinny one. Head to the Save Madeira Terrace project page to check out the amazing video they used for their campaign. 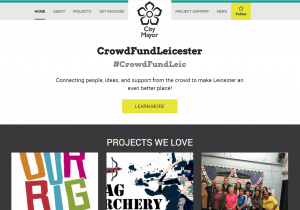 Spacehive is a donations based platform where Backers pledge money to improve their local area. Having the spaces people care most about improved by renovating a playground, creating a community hub, or saving a historic building, is the reward of the crowdfunding campaign. Because of this, Spacehive doesn’t ask Project Creators to offer additional rewards as an incentive to back a project, asking instead to focus on the core project they want to deliver. If a rewards system could help engage a community around a project idea you have, please get in touch at info@spacehive.com to discuss the best way of displaying them. Can I collect Gift Aid on pledges? Projects created by charities or CASCs can set up an automatic email to Backers, asking if they’d like to claim Gift Aid on their pledge. The email requests the Backer to provide the information needed to claim GiftAid, which is a postcode and confirmation statement (confirming they’ve paid more in income tax than the value of their pledge). You will then need to collate their details using the spreadsheet template and make your claim online. Because donations on Spacehive are conditional (only taken from backers if the project reaches its target) you cannot make the claim until the project has hit its crowdfunding target, meaning Gift Aid donations you collect will not count towards your crowdfunding target. Claims made via Charities Online are normally paid within 20 working days of HMRC receiving the claim. Please email support@spacehive.com if you’d like the automatic Gift Aid emails set up for your project. How can I show money or items I’ve already received before crowdfunding? If you’ve already begun the fundraising effort for your project before coming to Spacehive, you can show any funds raised or items received as pledges on your project page. Showing that there’s already funds raised towards the project will help get your campaign off to a good start, by showing Backers there’s already others supporting it. To do this, list out the full budget for your project in the costs section, adding any items already received or purchased as an in-kind cost, and any funds raised pre-campaign (cash or grants, for instance) along with evidence. In-kind cost items will show as both a cost to the project and a donation – as it’s a good already received – whereas funds raised will show as a pledge towards the project. Anything raised and added in to the project before the campaign begins is not subject to Spacehive’s 5% fee. Please note that to ensure transparency, once you’ve begun fundraising you cannot swap out Cost items for additional in-kind donations. You must raise the full target amount that you agreed upon and Locality verified at the start of the campaign. How can I hide my project whilst I’m making changes? Once the first 5 steps of creating your project have been completed, you’ll have enough information to share a project page. No information is locked at this stage and you can continue making edits up to submitting for verification (what is verification?). Publishing a project page allows you to share a link with friends or other members of your organisation to get some feedback on the page, whilst still editable. By default the page will remain hidden and you can toggle the visibility of the page between being public and hidden by clicking the ‘Project is publicly’ switch in your project dashboard. Having a live page doesn’t allow people to make pledges yet, you must be verified before being able to start fundraising. Should I include VAT on my costs? VAT is charged by UK companies providing goods and services that are VAT registered. The current rate of VAT in the UK is 20%. When creating your Project please consider any VAT you will be charged within your project cost lines with the costs section. To ensure your crowdfunding target is accurate please use the total including VAT checking with your suppliers if VAT will be payable if required. Which parts of my project are shared publicly? There are 9 steps to creating a project, each containing different pieces of information relevant to your project. 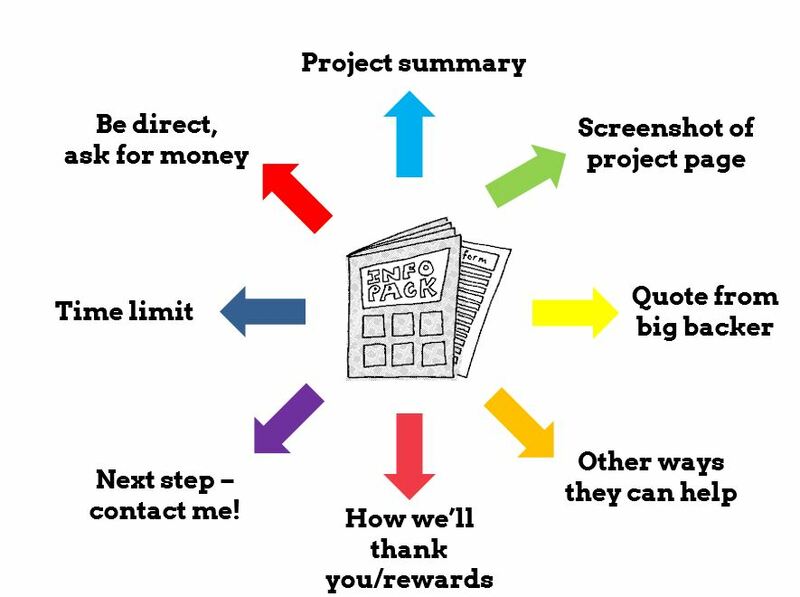 Some of these steps are shared with the crowd so they have all information needed in order to understand your project idea and make a pledge, and other pieces of information are shared with our verification partner, Locality, to help them assess the viability of your project idea, and make sure it can be delivered. Project description – So Backers can read about your project and understand your idea. Images and video – An opportunity to shows the faces behind the project and what the final project might look like. Location – So everyone knows where it’s going to happen. Milestones – Outlines the timeline of delivering the project once the funds are raised. Cost items – Everyone can see how much the project will cost and where the money will be spent. Any additional information requested by Funds whilst making an application. Visit some of our live project pages to get a feel of how your campaign will look once publicly visible. What are Funds, and how do I apply? Spacehive partners with Local Authorities, Companies and Funding bodies across the U.K who are like minded in their support of local projects, and want to help the community to fund them. To do this they set up a ‘Fund’ on Spacehive, which is a pot of money that projects which match their funding criteria can apply to, whilst creating a Spacehive project. After the initial Project Idea has been created, everything from entering the main description to the project costs, you’ll be matched to Funds whose criteria you meet. The criteria is based on the type of project you’re creating, (Green Space, Sport & Play etc) the impact it will create (Help the Environment, Boost the Local Economy), the type of organisation you are, and often most importantly, the location of your project. The Funds you’re project has been matched to will then be promoted to you in your Project dashboard so you can review them, and submit a pitch to any you feel could benefit your campaign with a pledge. Because Funds make up 35% of funding to Spacehive projects on average, they do have the option to ask some additional questions that might be expected of larger funding bodies in order to submit a pitch, but usually no more than 3 or 4 additional documents or answers are needed. Please note you can only apply to Funds before submitting your project for verification. After this the Funds will be locked, so please consider applying to each Fund before submitting for verification. To view the full list of Funds your project could be matched to, have a look at our Fund directory, here. How will the funds I applied to pledge to my project? There is no guarantee of any Fund pledging towards a particular project, they make their decisions on the same basis as the rest of the crowd: how much they like your project idea, and how much support it has from the community. If a Fund likes the idea and you can show that the community do too through some smaller but equally important pledges, the Fund may well make a pledge. Should the Fund do so, the pledge will be added to your campaign in the same way as any other pledge from the crowd, and will help you reach your overall funding goal. There’s no set amount that the Fund will pledge, it can be any amount up to their maximum pledge per project which is outlined on the Fund overview page during pitching, or on the Partners profile page. Visit the Fund directory for more information on Funds. What is verification? How long does it take? Before a project can start crowdfunding it must be verified by Locality. This involves inspecting the project to make sure it’s viable and trustworthy. What do I need in order to get verified? The verification process takes on average 2-5 days. It is quicker the more prepared the project creator is for Locality’s questions, which depending on the nature of your project are likely to pertain to the following things. Have these to hand to insure a speedy verification. Before you can submit your project for verification you must fill in all the Project Details in your project Dashboard. You’ll know when you’ve filled in all required fields because a button will appear asking you to submit for verification. After submitting the project for verification you will not be able to edit your project page, except from your ‘Video and Images’. Locality will email you within 48 hours. If Locality are unsatisfied with the project proposal they’ll give some feedback then send your project back a step so you can make some edits and hopefully rework your proposal until it’s ready for verification again. Once you’ve been verified you need to set your campaign end date. Check out these tips on how long to run your campaign for. Spacehive does not guarantee projects but, to help reduce risk, all projects are verified to try and establish if they are viable before they start funding. Verifying projects helps to protect potential funders, makes it more likely projects will succeed, and maintains confidence in the system. What’s GoCardless? And what other payment systems can I use? 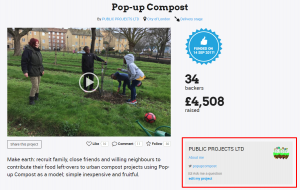 Spacehive projects can use PayPal and/or GoCardless to collect pledges. PayPal allows backers to pledge directly from their PayPal account, whereas GoCardless is a direct debit system that allows people to make payments directly from their bank account, via a one-off direct debit. The direct debit is set up when Backers pledge, allowing Spacehive to collect the funds from their bank account at the end of the campaign, should you reach your funding goal. Because it’s a one-off direct debit, only one payment can ever be taken. It’s well worth adding both if possible as it gives potential backers more choice, and each platform has different benefits. PayPal allows Backers to pay from anywhere in the world, and GoCardless has lower transaction fees for UK based pledges. For more information on setting up a GoCardless account visit our guide, here, and the table below has more information on both platforms. How long should I run my campaign for? Spacehive projects can run for anytime up to 365 days, but we recommend keeping to the guidelines below. Please note, your fundraising campaign period cannot be changed once your project is live. Shorter projects set a tone of confidence, excitement and urgency, which helps to motivate people to get behind you. It can be hard to maintain interest and momentum over long drawn-out campaigns. Short campaigns do require a great deal of pre-planning, including things like warming up your backers and drawing up a campaign timeline. The more work you put in beforehand, the easier time you’ll have throughout the campaign! When choosing your campaign launch date, please take into consideration that verification typically takes 1-7 days depending on the complexity of the project. To speed up the verification process, make sure to have proof of quotations and permissions ready to present if need be. Similarly, if you need the funds by a certain date, please bear in mind that it can take up to two weeks for the funds to come through after hitting your target. Unverified PayPal and GoCardless accounts are the main cause for delays, so please make sure your payment accounts are verified by the time you hit your target. Overfunding is a feature that allows you to continue collecting pledges if you hit your funding target before your campaign period ends. Projects that overfund can continue fundraising for an extra month beyond their original campaign end date. There is no limit to how much extra money you can raise when you are overfunding – but you have to explain how you will use it. You can stop overfunding and end your campaign whenever you want. Overfunding can be useful if you have a core project that you need to raise money for but can also see ways to add to it, if your campaign proves popular. Great, how do I do this? You can enable overfunding within the costs section of your project dashboard. We’ll ask you to list the things that you’d spend the extra money on. This will be displayed on your project page. You can only enable overfunding before your project is verified. What sort of costs should I overfund for? Overfunding should be used to raise funds for added extras – things that would make your project even better, rather than things that are essential to getting the core project delivered. If you do decide to use overfunding, be careful not to mislead your backers by telling them that your core project includes things you can only deliver if you overfund. If I have more questions what should I do? If you can’t find what you need in our FAQS please contact us here or tweet us @Spacehive. Can I edit my project after verification? Not sure what verification is? From the moment you submit your project for verification, to the moment your project is delivered, you won’t be able to edit your project page (e.g. the description, costs, or payment details). This is because your project, as it is packaged up for verification, is the idea that gets reviewed. Being able to edit your project post-verification would render the verification process futile. You can however add or remove photos, post updates, and edit your profile information. If there are any other changes (e.g. typos or event date changes) please email support@spacehive.com and we’ll endeavour to fix these for you. How do I communicate with my backers? Spacehive Update Tool; sends an email to your crowd and posts an update on the project page. Try to send an update every week or two with an image and maybe some social media post templates for them to copy, paste, and post. Social media (Facebook, Twitter, Instagram, Pinterest, etc. ); use post scheduling tools Buffer/Hootsuite to ensure a steady stream of posts, and Canva to make interesting accompanying graphics. Consider posting short 10-sec videos of your backers explaining why they’re supporting the project. Newsletters; use your own mailing lists as well as those of others to promote your campaign far and wide! Events; re-spark your audience’s excitement with wine and pizza at a 50% event. Getting everyone together in one room is very powerful and will catalyse another wave of pledges. Leaflets and posters; bright and colourful, help them to imagine what they’ll get if the campaign succeeds. Don’t forget to use your project link/URL! How do I post an event on my project page? During your crowdfunding campaign there are a few things you can do in order to garner support from those who may not come across your project online. Organising an event is a great way to engage your community and reach new prospective backers, driving support for your project. Once your event is planned and you’ve set a date be sure to let your backers know by posting it on your project page. To do this, just log into your Spacehive account and go to your project dashboard. On the left hand side underneath ‘Posts’, you’ll see ‘Events’. Click the yellow button that says ‘Add Event’ and you’ll be given the chance to add details such as the location and start time, as well as an eye catching image. You can also post press pieces on your project page, click here to learn how. How do I post a press piece on my project page? Approaching local and national press can be a great way to gather momentum for your crowdfunding campaign. People are more likely to back your project if they see exciting coverage from newspapers, magazines, bloggers, or other publications. To post an article on your project page just log into your account and go to your project dashboard. On the left hand side underneath ‘Posts’, you’ll see ‘Press’. Press the yellow button that says ‘Add Press Coverage’ and you’ll be given the chance to add details such as the publication date and the journalist’s name, as well as a link to the article. Be sure to encourage your backers to share the article and spread the word. You can also post events on your project page, click here to learn how. Why does my Spacehive target keep changing? Your crowdfunding target fluctuates according to the transaction fees (PayPal transaction fees are 3.4% + 20p per pledge, whereas GoCardless charge a flat 0.5%). Spacehive estimate your total transaction fees at the start of the campaign and add this onto the funding target. Spacehive over-estimate the fees so you’re likely to see the fees come down throughout your campaign, especially if you’re getting more pledges through GoCardless than PayPal, or if you’re have a series of large pledges. The Wish List is similar to overfunding as it’s designed to make your core project even bigger and better, but instead of asking people to pledge money like in overfunding, it gives them the option to donate items instead. You can add items to your Wish List at any point during your campaign. The public can then view the Wish List on your project page and either offer anything you’ve requested, or offer anything else similar that they think could help. Should you then choose to accept the offer, at which point it will appear on your project page as being received. How do I verify my PayPal/GoCardless account? Spacehive uses external payment providers to accept and collect pledges to each project, PayPal and GoCardless. You can set up and add either account to start fundraising, but the accounts must be verified by the end of your campaign in order for you to receive the pledges. PayPal/GoCardless ask that you verify your payment accounts to comply with anti-money laundering laws. The steps below briefly outline the process of creating and verifying a GoCardless account, please read Spacehive’s guide on creating a GoCardless account here to see the process in full. Log in to GoCardless via their website. Once logged in, click on ‘Settings’ in the top right corner. Click on ‘Company Info’. You should see a list of criteria, some might have green ticks by them. To verify your GoCardless account click on ‘Company Details’ and fill in all the required fields. Once your account is successfully verified a green tick will appear by ‘Company Details’. If you need any help verifying your account then get in touch with GoCardless. To start the verification process log in to PayPal and click the ‘Add bank account’ option in the dashboard. PayPal will then make a deposit of £0.01 into the designated bank account with a 4 digit confirmation code in the reference. Check the bank statement online for the transaction, enter this code when prompted in the same ‘Add bank account’ section, and the account should be enabled to accept payments. For a business account the email address on the account may also need to be verified. To do this log in to the profile section of PayPal where there should be an email address on the right hand side. Click update email and enter an address, then check your inbox for a verification email from PayPal. Once this is complete and the bank account has been verified, your account should be ready to accept payments. If my project falls through, what should I do? In the event that circumstances change and you are no longer able to deliver your project please contact us as soon as possible and we will end your funding campaign, meaning none of your backers will be charged. We recommend you use the Update Tool to notify all of your backers before we end your campaign. When we set your project back to Idea Stage you will still be able to access the names and email addresses of all your backers in the Your Crowd tab of your Dashboard, should you wish to try running the crowdfunding campaign again. How do I approach businesses for a pledge? As you’re adding value to the neighbourhood, local businesses will be keen to put their name to the cause. However, approaching them at the right time is essential to making sure that your efforts aren’t in vain! Businesses will only wish to back projects that already have a significant amount of backers, so make sure not to approach them prematurely. When the time is right, pop in and ask for a chat with the store manager ‘to hear their thoughts on a local community project you’re running’. If they’re not in, arrange a time to come back, or if that’s not possible ask for an email address/phone number. When you meet them for the first time, make sure to take a carefully put together info pack. How do I get media coverage? Getting media coverage is a great way to build awareness and get more people pledging to your campaign but it’s not always the easiest to do. Follow these seven steps to write a press release, contact journalists and let the world know you’re a community crowdfunding hero. Running a crowdfunding campaign isn’t in itself newsworthy (we obviously think it’s pretty great though! ), so it’s important to wow the media with your story instead. Is your project the first of its kind? Will it break records by being the biggest, oldest, longest, most superlative of projects? Find the angle that makes your project special and selling your story will get much, much easier. For more guidance, check out our article on how to write a powerful press release here. Your story is immediately more relevant to people in the area (and importantly they’re the ones most likely to pledge to your campaign!) so start by contacting your local newspapers and radio stations first. Is your project helping the environment? Or creating jobs? Or making something beautiful, weird or giant that people will want to know about? Consider which publications would be most interested in covering your story and contact them first. Reach out to influencers, not just media. Zoella is a YouTube celebrity with more than double the online following of the Financial Times. She might not be the best person to promote your project but it’s a good idea to think outside of mainstream media and make a list of local bloggers, tweeters and community influencers (whether the head of the local Mumsnet group or the landlord of the most popular pub in town) who could help promote your project to an even larger audience. Contact journalists early on in your campaign so that there are more opportunities for them to cover your story and so that any subsequent press coverage can help you to raise awareness and funds for your campaign. A picture speaks a thousand words and can often sell your story better than your most powerful paragraphs. Oh and journalists always appreciate it when they don’t have to go finding appropriate images themselves. Fact. So they didn’t bite when you sent them the press release about your campaign launch? No worries. Get in touch again whenever you hit significant milestones – a crowdfunding campaign may not capture a journalist’s imagination but 100 or more local backers, celebrity supporters or significant donations may well do. Because if at first you don’t succeed, then do what the All Blacks rugby team would do… Try and try again. And if you do manage to get your crowdfunding campaign in the press? Post the press piece on your project page! How do I receive the funds? How long will it take? A pledge is a promise that the backer will pay the project delivery manager if they hit their target. When a project hits its target Spacehive sends an email to all backers, informing them that their pledge will be taken in the next couple of days and reminding them to make sure they have sufficient funds available. After this email, Spacehive will collect the pledges and endeavour to send them to the project delivery manager within 1-2 weeks. It’s very normal for a small percentage of pledges to fail during the collection. If a pledge fails Spacehive will send an email to the backer reminding them what the pledge is for and asking them to check that their GoCardless/PayPal account is set up to make the payment. Spacehive will attempt to re-collect the failed pledges twice more. Once 90% of the funds raised are collected Spacehive will then transfer the funds to the project creator. Backers who cancel their pledge after the target is reached, or whose pledge fails three times will be emailed individually with instructions on how to pledge to the project creator outside of Spacehive. Please note, if Spacehive cannot collect enough pledges that they deem sufficient for project delivery (e.g. less than 90%), then all collected pledges will be refunded to the backers. For funds received via PayPal you will receive several individual deposits from each of your backers in your PayPal account. PayPal will notify you when the deposits are made. Once you have received your funds you can extract them to your bank account. For funds received via GoCardless you will receive a single deposit directly in your bank account. GoCardless will notify you when the deposit is made. If a project creator has not verified their GoCardless/PayPal accounts then the funds transferal is delayed. In order to make sure your account is set up sufficiently to receive funds, please either log into your GoCardless/PayPal accounts or contact their respective customer support teams. Can I relaunch my project if it’s unsuccessful? Yes. However, if it wasn’t successful the first time, it’s worth considering whether you need to adapt the idea or your crowdfunding plan before starting again. For example by reducing your costs, increasing its appeal/widening your audience, or improving your social media reach. What do I need to do after I’ve received the funds? After you’ve reached your target and the funds have been paid out, the main thing to do is focus on delivering the project. Along the way though you should keep your Backers up to date with regular updates, as explained here, and once it’s delivered you need to let them know, explained here. There’s no further requirement to provide any more information to Spacehive, apart from filling in a delivery report once the project is up and running to share the impact you’re making. For the majority of projects this is optional, although we do strongly recommend you complete it to share the impact with your deserving backers, and to use as a project CV which may help you unlock further funding, or to raise money for another project. However, some Funds require impact reports from projects they pledge to in order to assess how their funding is being spent. This will be made clear during a pitch to a Fund, and also in follow up communication from the Fund via Spacehive. Find out more about Impact reporting here. How can I keep backers up to date about my project? After your project has been funded and the pledges paid out, it’s important to keep your Backers up to date with any developments in delivering the project. This can start with an invitation to a celebration event for the campaign, and run all the way through to a launch event when the project is open and ready to use. Posting updates through the ‘Posts’ tool will send emails to your Backers and Followers, and post the information on the timeline of your project page, so everyone can see the great work you’re doing. How can I show people my project is delivered? Once your project is delivered people will want to start using it, so let them know they can! You can tell people it’s delivered via an update from the ‘Posts’ tool, and by sharing the impact you’ve been able to make through Spacehive’s impact reporting tool. The reporting tool asks you about the tangible impact your project has made, as well as any other benefits gained from running the campaign and delivering the project. Whether you’ve provided jobs or volunteering opportunities, improved or created a local green space, or increased access to public art or sports facilities, you can share the impact to all your Backers and Funds through the one tool. The data you enter will then be turned into an easy to read, colourful report that’s shared on your project page, and via an email to your followers. How do I pledge? What payment methods do you accept? To pledge to a project, just click the yellow “Back this project!” button on any project page. You will then be asked to enter your pledge amount and select if you want your pledge to be anonymous or not. If you’re not logged into a Spacehive account you’ll be directed to log in or create an account. Spacehive require basic account info (name, email address, and password) so that we can contact you regarding your pledge if need be, and so that you can edit your email preferences. It’s a nice touch to also add a photo to put a face to the pledge. After creating your Spacehive account you’ll be able to select your payment method. There will be (either or both, depending on project creator preferences) PayPal (debit or credit card) and GoCardless (bank account Direct Debit). You will be asked to authorise the payment but will only be charged if, and only if, the project hits its funding target. If the project doesn’t succeed, you won’t be charged anything. Can I pay with a cheque or send cash in the post? To quickly and easily collect pledges for projects, Spacehive use two secure, widely used, external payment platforms, PayPal and GoCardless. We strongly recommend pledging through these mediums. However if you can only pay via cheque or cash feel free to contact the project creator. If you create a Spacehive account and revisit their project page you’ll be able to send them an email by clicking ‘Ask me a question’. Please note, if you pledge in cash/cheque this pledge might not be returned by the project creator if the fundraising target is not reached. If you pledge online, Spacehive only collect your pledge if and when the project hits its crowdfunding target. Yes. Just check the ‘Pledge anonymously’ box. This will hide your name but show the amount. If you make an identified pledge then wish to make it anonymous, please email support@spacehive.com. Can I make a pledge from outside the UK? If you are pledging from outside the UK please choose PayPal as your payment option. This will allow you to pay from a non-UK bank account or credit and debit card linked to a PayPal account. If you don’t already have a PayPal account you’ll be able to set one up, and link it to your bank account or card, at the same time as making your pledge – it’s quick and easy. Please note, if PayPal isn’t a payment method offered on the payment screen please contact the project creator who may be able to set up PayPal so that you can pledge this way. Why is my pledge appearing as a Direct Debit? When pledging through GoCardless the pre-authorisation is set up via Direct Debit, so although it is only a one off, it will appear to be the same as any other DD’s on your account and statement. You will only ever be charged once for your pledge, and only if the project succeeds in hitting its target. Can I amend my pledge? You cannot amend the amount you’ve pledged directly through Spacehive. However, you can cancel your pledge in your PayPal account or your bank account (GoCardless) in your pre-approved payments or direct debits, then you can go back onto Spacehive and re-pledge the amount you wish to give. You cannot cancel and re-pledge if the project has already come to the end of its campaign. You can also top up your support to the project by simply pledging again! Can I cancel a pledge? By pledging, you are committing to supporting that person’s project; cancelling that commitment is discouraged. PayPal – navigate to your pre-authorised payments and cancel your pledge. This will be updated on the project page on Spacehive. I have a question about the project, who can I contact? You can do this by leaving them a message (in the comments box at the bottom of their project page), by tweeting them, or posting on their Facebook wall. Alternatively you can send them an email; just create a Spacehive account then revisit their page to click on ‘Ask me a question’. Movements are communities of project creators and backers who come together to achieve a common goal – from transforming Hull and saving Lidos to creating new green spaces or fueling arts projects. Want to start a Movement of your own? Consider becoming a partner. Discover Movements on Spacehive here.